According to Darwin’s theory of evolution organisms which are better adapted to their environment tend to survive longer. Does the environment we create influence the selection process and favor those that possess attributes that give them a temporary advantage while at the same time disqualifying those who at that moment in time are struggling to adapt? Adaptive behavior is key to the survival of the human race and specific to soccer, a trait of high quality players. However if the early environment supports only temporary adapting systems ( in this case the young player) then those that are better equipt to adapt in the long run may well be lost to us forever. Are some systems and structures just counterproductive ideologies that that are in conflict with development (learning & biopsychosocial) and the young player’s natural learning process? We should of course remember that struggle is also part of the learning process. What are we doing to help players overcome those struggles that will appear during their development (non-linear)? This is a pyramid structure that is based on erroneous presumptions. Development and performance are essentially linear. Early ability that is identified as talent indicates future ability and performance. Selection: Based on current performance. Identify those as talented as early as possible. Early specialization is deemed necessary to reach elite performance level in the future. Early performance and ability is necessary for success in the future. 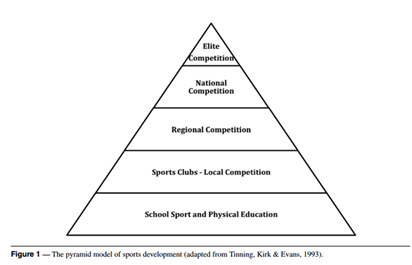 District team selection often begins at the age of 13/14 and is part of this pyramid. Its influence is felt years before the actual selection process. I recently spoke with a Swedish U17 youth international who said that this process can create and feed a stressful environment. Over a year before the district team selection, every day at school, at training, on social media each match or training performance was put under the microscope of analysis. “How did you play? How did I play? As well as being physically tired you would be mentally tired as well”. The player went on to say “I was lucky because I had an external support structure, family and good adult mentors that really helped me, I don’t know how I would have coped otherwise”. Competition, failure and struggle are of course part of the sporting experience. They don’t have to be negative experiences for children. The problems occur when it is all based on adult demands and values. These adult demands and values are appearing earlier and earlier in our sporting structures. The adult and the child, do they have the same motives? There is no convincing evidence that most sports require an early investment of training in one activity. In fact, what evidence is available suggests that across a number of eventual elite players, early specialization is negatively correlated with eventual success (Gullich, 2011). In the paper In the paper The Standard Model of Talent Development and Its Discontents (Bailey, R.P; & Collins, D. ) It is suggested that “the apparent success of the SMTD is ultimately an optical illusion as there is no way of knowing who might have succeeded through different systems, and who were de-selected from the system but might have (under different circumstances) gone on to achieve high performance”. The paper goes on to suggest risks associated with ill-focused of incorrectly administered pyramids. Early adult like training can lead to over-use injuries. There is a particular high risk associated with intensive training during maturation. Judging early performance during the formative years does have its problems. This is true especially when judging and identifying something that is non-linear using what is essentially a linear model. Often fails to recognize potential due to a focus on the performance now. Many pyramid structures based on early talent identification discriminate against those born later in the sporting calendar year. Size and strength factors that are identified early contribute to a temporary advantage resulting in short term superior performance. This all evens out after maturity. There is a risk that the player has been used for his temporary advantage (to win) and has not actually learned the game. This player will struggle when growth evens out when maturity is attained. Questionable accuracy with regard to measurement of ability, often affected by gender, ethnicity or socioeconomic background. Are we judging biological maturation or talent? Dutch Soccer coach Raymond Verheijen has presented data under the title “Growth spurt study in Dutch Youth Academy soccer”. A 12 year study that included 36 professional clubs was carried out in Holland between the years 1997-2009. An analysis of a data base of over 10,000 players was carried out where factors such as height, weight, injuries and date of birth were taken in to consideration. The general idea was that month of birth should have no influence on talent. At the beginning of the study the Dutch schoolboy national teams were selected from August to July. Most players were born in the period August to October (43%) while only 10% of the players were born May-July. This phenomenon is often referred to as the Relative Age Effect (RAE). Relative age effect (RAE): A bias that seems to favor a higher participation rate amongst those that are born early in the selection period). Hancock, Adler, & Cote in a study from 2013 suggested that RAE is more than just a physical advantage. The research suggested that there are also some powerful social influences at play. Parents (Matthew effect) – The rich get richer. Those who are perceived to have ability are given preferential treatment and extra support. This in turn increases that ability which leads to more support. Coach (Pygmalion effect) – The higher the expectation placed on people the better is their performance. Those who are perceived to have ability are given more attention. Others feel neglected. Athletes (Galatea effect) – A player may see that she is able to perform better than her peers. This performance can be due to due to early maturation A players opinion about her ability and his self-expectations about her performance largely determine the performance. During this study the Dutch FA changed the cut-off date for its national youth teams to the Jan-Dec period. The RAE adjusted accordingly. It seemed that the scouting system was primarily based on how old the player was as opposed to how talented that player is or could be. Countries with small populations have a relatively small player pool. Focusing on winning during the early stages of development just encourages the RAE, in turn making the player pool even smaller. It becomes more about the survival of the fittest as opposed to survival of talent. In the research paper “Swedish soccer is searching for talent but finding age” Tomas Peterson says why players are chosen in accordance with their physical development is not known “but one may assume that there is a silent agenda dictating that these players will be the most successful in the forthcoming selection steps” from club to district team to national youth team. The material and data collected “indicates that selection on the grounds of physical development is already at work in groups of 5-12 year olds and “ and the effect of this process is very clear when these children reach 13 and enter an even harder selection process. It is Tomas Petersons opinion that this is counter- productive to the development “of all the football talent that exists within every yearly cohort of girls and boys. I also believe that its goes against the goals of both the sports movement and the community in general”. Many current methods of focusing on early indicators of talent are very static and linear approaches. They ignore the fact that development is individual and that differences in performance can be explained by differences in maturation. Coaches that judge early talent evaluate and focus on the contemporary level of performance where physical characteristics are fundamental factors in the talent identification process. This brings to the surface three fundamental problems that need to be addressed with early talent ID. If we want to keep players viable over what is essentially a long, complex and sensitive development process then the aim should be to keep as many as possible as long as possible active within our sporting organization. What are we doing to help certain players overcome struggles that will appear during their development (non-linear)? What role does the environment play in creating these struggles? We should remember that failure and struggle is also part of the learning process. Our environment should be a place where these failures and struggles can be met head on and dealt with through patience, encouragement, understanding and support. Does the environment we create influence the selection process and favor those that possess attributes that give them a temporary advantage while at the same time disqualifying those who at that moment in time are struggling to adapt? 1. We give every player that makes the program 2 years to develop pretty much guaranteed. 2. If a player does not make the freshmen team, they can come back the following year and tryout for JV because it is likely we will have openings. In order for this to work, you have to have solid positive coaching at all levels. It is working pretty well for us right now. Great..how is it working out? This research and article explain what I have been wanting to write an article about for USA volleyball for 2 years now. I have called it “The Hunter Gather approach vs Teaching, Growing Kids”. I have seen a great deal of “child and parent courting” by large volleyball clubs. They want the best athletes, according to the current system. What they don’t do, in reality though, is look for the best talent. They look for the best “ALREADY DEVELOPED” talent. If we look at the last Women’s US Olympic volleyball Team, you see the african american phenominal player who never played college volleyball before being “turned into” an Olympic level volleyball player. She was a track athlete. The volleyball clubs everywhere in her life did not develop or select her. This is happening everywhere I look, from 3rd graders on to College. Coaches are not “developing players” many times. They are just “hunting” for the best players out there and “gathering” them for their team. They teach them then by having them learn from watching other players in tournaments. Once the basics are taught, I do not see much development. Otherwise, why would we not take the tallest and most agile athletes out there? Because their parents often do not have the money or time to get them there, because they are poor. So we continue the cycle of supporting the best talent that has enough extra money and time enough to develop it, NOT THE BEST ATHLETES that could be developed. Thank you for this research and information. I find it puts science behind what I am seeing and wanted to bring to our attention. A fantastic article that backs up what I am seeing as a Physical Education teacher and a sports coach in the UK. Encouraging clubs and teams to commit to a model like this is the hard part, I particularly like the hunter gather analogy mentioned above. Within the football (soccer) club I coach the U8s and am taking a long term view on the coaching, thankfully the parents are supportive of this approach but if they do question it I will be using this article to back up my gut instinct. I also think it raises the great untapped late developers – although a few football clubs are starting to look in to this. So many athletes develop late as they have the all round athletic ability to do transfer skills akin to the volleyball player mentioned above. Mark, I am wondering if you would consider allowing me to repost “SURVIVAL OF THE FITTEST OR SURVIVAL OF TALENT” on my club’s website. I really admire your passion and dedication to improving coaching and player development in the ranks of youth football clubs. Have been saying this for 30 years, glad to see someone put some serious discussion and numbers to the insight. Age based teams only exacerbate the situation. Will be reposting to several coaching forums with the proper info you asked be included. Finding talent, Developing talent, Maintaining Talent to elite status, cannot be done without Psychological profiling as step 1. Finding talent is the first step in the pyramid. 1.Who finds the talent ? 3.,What are you or your club looking for. 4. What do you do when you find talent. 5. Can he/she maintain there talent. 8. Has any other family member ever had talent. 9. What age is the talent. 10. Has the talent ever played another sport. 11. Does the talent have any siblings. 13. What level coaching has the talent had. 14. Is any family member a coach. 15. Is the talent in Education. 16. What religion is the talent. 18. Are both parents working. 19. Do any family member have ill health. 20 . Where does the talent live. I could probably do another 20 Questions, just on recruiting the talent. Unless you have a proven track record in talent identification in sport, my experience working at the highest level possible, you will have limited success. If you collect information from people who have succeeded then you will produce talent. The one main factor in Talent Identification is IF THE TALENT CANT LISTEN (UNDERSTAND)THE TALENT CANT LEARN. The pyramid may be the first step but that pyramid starts far too early in many cultures. This is, as many posters have said earlier, a crucial breakthrough in reporting what has been a prevailing instinct in any sport system. In Canada, the federal government mandated Long Term Athlete Development (LTAD) models for each sport…essentially a recipe on how to develop an athlete. However, the pyramid persists as the ‘on-the-ground’ volunteer coaches and sport managers (parents) do not have the knowledge base to implement the system you describe here. The next step is to develop a set of criteria from the results in easy-to-follow steps for the local sport associations to implement. In my experience, it is rare where the top-down approach gets action on the pitch. Again, fantastic information! Well done! Great article. Explains why competitive hockey in Canada is turning into “rich sport” . Parents pour thousands of dollars into specialization at such a young age. Kids need to play multiple sports as part of their overall development. If the athlete is good, talent will be found. Parents just need to relax and be thankful their child is playing and getting exercise.